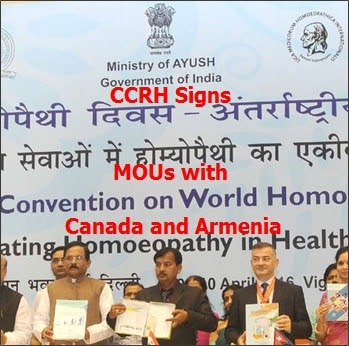 CCRH has signed two MOUs with Canada and Armenia during two day International Convention on WHD Central Council for Research in homoeopathy (CCRH) has signed two MOUs with institutions of higher education of Canada and Armenia. These MOUs between CCRH and College of Homeopaths of Ontario, Canada and another between CCRH and Yerevan State Medical University, Armenia, were signed during two day International Convention on World Homoeopathy Day organized at Vigyan Bhawan, New Delhi. Shri Shripad Yesso Naik, Honble Minister of State (IC) for AYUSH in his valedictory address greeted the people of India on the occasion of World Homoeopathy Day and appreciated that Homoeopathy has taken major scientific leaps in the past and its body of evidence is growing by the day. The Minister also complimented the steps taken towards international cooperation during the convention, as it saw the signing of two MoUs in the field of education and research in Homoeopathy. He expressed his hope that signing of these MoUs was only the beginning and many such bilateral cooperations will be agreed upon in the times to come. He remarked that with research becoming a prime concern in Homoeopathy, many more international collaborations are possible and highly recommended. The second day of International Convention on World Homoeopathy Day began with a session dedicated to the founder of Homoeopathy, Dr. Christian Samuel Hahnemann. A floral tribute was paid to the legendary figure by the chairs and discussants of the panel Dr. Renzo Galassi, President, Liga Medicorum Homoeopathica Internationalis (LMHI) (Italy), Dr. Gustavo Alberto Cataldi, LMHI (Argentina), Dr. Amarilys Cesar (Brazil), Dr. Altunay Soylemez Agaoglu (Turkey), Dr. S.P.S. Bakshi, National Vice President, LMHI (India), Dr. Nandini Sharma, Chairperson WHD (India), Dr. Sandeep Kaila, Secretary WHD (India), Dr. Ramjee Singh, President, Central Council of Homoeopathy CCH (Ministry of AYUSH, Government of India), Dr. Arun Bhasme, Vice President, CCH (India), Dr. Bhaskar Bhatt, President, HMAI (India), Dr. K.K. Juneja, Chairman, Delhi Board (India), Dr. M.A. Rao, President, Indian Institute of Homoeopathic Physicians, Dr. M.G. Oomen, Founder National President, Indian Homoeopathic Medical Association. Dr. Raj K. Manchanda, Director General, Central Council for Research in Homoeopathy. A session each on challenges in education in Homoeopathy in India and global scenario of education in Homoeopathy were chaired by Dr. Ramjee Singh, Dr. Arun Bhasme, Dr. Srivatsan and Dr. Lalit Verma, while Dr. A.K. Seth, Dr. Rajat Chattopadhyaya, Dr. S.K. Tiwari, Dr. Manilal S., Dr. Arvind Kothe, Dr. Munir Ahmed, Dr. Leopold Drexler (Austria), Dr. Gustavo Alberto Cataldi (Argentina), Dr. Mohammed Ashrafur Rahman (Bangladesh), Dr. Danny Pillai (South Africa), Dr. M.P. Arya (India) and Dr. M.K. Sahani (India) were in the discussant panel. The panelists discussed about the concerns and challenges in global and Indian scenario of education in homoeopathy and how there could be standardization of education for accredited curriculum for education in Homoeopathy. Another session on drug validation and drug development explored the therapeutic potential of nosodes (homoeopathic drugs prepared from disease material) and discussed the idea of reinventing nosodes, by way of their preparation and application in clinical field. This session was chaired by Dr. Martien Brands from Netherland, Dr. Isaac Golden from Australia and Dr. Laxmikanta Nanda from India. Dr. S.M. Singh, Dr. J.D. Daryani and Dr. Anil Khurana were the discussants. The speakers of the session on harmonization of pharmacopoeias and drug laws brought up many vital issues like regulation of homoeopathic medicines worldwide, need for a common international pharmacopoeia, pharmacopoeial standards on homoeopathic drugs,drug regulations and need for upgrading specifications of plant raw materials in homoeopathic pharmacy. Biomolecular research in homoeopathy was another session at the convention, which was chaired by Dr. Anisur Rahman Khuda-Bukhsh, Prof. (Dr.) Carla Holandino Quaresma (Brazil) and Prof.(Dr.) Kanjaksha Ghosh. Dr. Surender Singh and Dr. Anil Khurana were the discussants. After elaborate presentation on basic research updates by Dr. Peter Fisher, Editor, international journal Homeopathy, presentation on topics ranging from homeo-genomic approach towards personalized therapy of cancer, hypertension and oxidative stress parameters of kidney by modulating enzyme hypertnsive rat model, anti heat shock effect of Cantharis 200 transported from one plant to another through capillary water, to protective role of Rhus toxicodendron 6c on cells of primary cell culture in relation to dengue virus infection and molecular level correlation between probable homoeopathic medicines and bio-samples of patients. Besides these, there were several presentations on clinical research including latest research updates, and role of Homoeopathy in malaria, dengue, natural disasters, brain injuries, chronic ear infection, sciatica etc.